Captain Matthew Webb was born at Dawley in Shropshire, one of twelve children. He acquired his ability to swim in the River Severn at Coalbrookdale. At age twelve Webb joined the merchant navy, starting with a three-year apprenticeship. Later, whilst serving as second mate on the Cunard Line ship Russia, he attempted to rescue a sailor, who had fallen from the rigging of the ship, by diving into the sea in the mid-Atlantic. Webb swam for more than half-an-hour, but the man was never found. Webb’s daring won him an award of £100 and the first Stanhope Medal, and made him a hero of the British press. In 1873, Webb was serving as captain of the steamship Emerald when he read an account of the failed attempt by J. B. Johnson to swim the English Channel. He became inspired to try himself. On 12 August 1875, he made his first cross-Channel swimming attempt, but strong winds and poor sea conditions forced him to abandon the swim. Just 10 days after this first abortive attempt, on August 24 1875 Webb dived from Dover ’s Admiralty Pier and headed towards France. Porpoise-grease helped insulate him against the cold, but couldn’t prevent the pain of numerous jelly-fish stings. Tantalisingly close to the French shore strong currents prevented him from completing the last few miles for several hours; but eventually the currents slowed and his steady breast-stroke won out. Webb walked ashore some 21 hours and 45 minutes after he left England. His zig-zag course across the Channel had totalled over 39 miles (64 km). He was an instant national hero. After his record swim, Captain Webb basked in national and international adulation, and followed a career as a professional swimmer. He licensed his name for merchandising such as commemorative pottery and wrote a book called The Art of Swimming. A brand of matches was named after him. He also participated in exhibition swimming matches and stunts such as floating in a tank of water for 128 hours… don’t tell David Blaine. 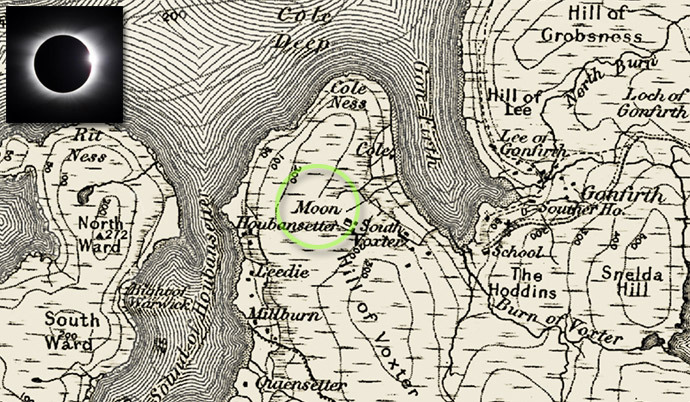 The proportion of the sun covered by the moon in the Shetland Isles was expected to be 97% in today’s eclipse – not far off a total eclipse and was measured as the darkest place in the UK. The perfect place to have watched would have been Moon on the west coast of Shetland Mainland. Records of solar eclipses have been kept since ancient times. Eclipse dates can be used for dating of historical records. A Syrian clay tablet records a solar eclipse which occurred on March 5, 1223 B.C. while a stone in Ireland is thought by some to record an eclipse in 3340 B.C. Chinese historical records of solar eclipses date back over 4,000 years and have been used to measure changes in the Earth’s rate of spin. Places in the UK that reflect the main elements needed for an eclipse include the previously mentioned Moon in the Shetland Isles, Sun Rising in Warwickshire and Eclipse Street in Cardiff. The UK will not experience a solar eclipse on this scale again until 2026 and there may be a lucky few, who are already born, who will live to see the next total eclipse in the UK in the year 2090. Mapmaker Plus – Price drop! Create your own bespoke maps with Mapmaker Plus. Large format maps supplied folded or rolled. A total combination of 13 map scales and series. Maps available from 1805 to the present day. Choose from seven OS Historical Map Series. 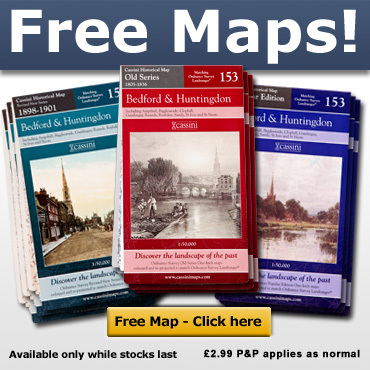 Now includes six present day Ordnance survey mapping series. Historical Map Downloads – Half price! Coverage – England, Scotland, Wales. Cassini’s downloadable maps from 1805 to the present day. • Instant map downloads of any area. • Including personal inscription. • Highly customisable. • Coverage of England, Scotland* and Wales. Cassini is delighted to offer you our stunning range of historical Ordnance Survey maps. Whatever your interest in the past our historical maps are invaluable works of reference. Ideal for reasearch, or print and frame for a personalised decorative map centred on the location of your choice. Simply search for the area you are interested in, buy and download the PDF. No waiting for the map to arrive in the post. *Scottish maps are only available for Old Series 1805-1874, Revised New Series 1896-1904 and Presentr Day OS mapping. Visit Cassini Maps to find maps of your area. Free historical map of your home! Only one map per visit. Available only while stocks last. Cassini’s historical printed maps are digitally enhanced reproductions of the original Ordnance Survey maps of the same names – but with a very important difference. We have combined, re-projected and enlarged them to match the scale and coverage of the present-day Ordnance Survey Landrangers®, so making direct comparison between the past and the present easy and accurate. 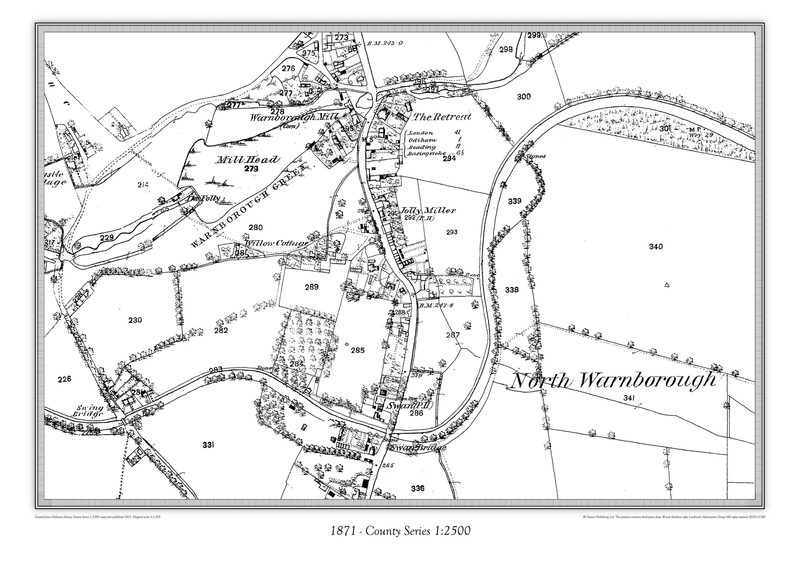 Created from Ordnance Survey Old Series Edition maps first published between 1805 and 1874 These maps were the result of the first ever national survey of England & Wales. From the late 1790s until 1874, a small army of surveyors covered every corner of the what was still an almost entirely rural country. Their work provided a stunning portrait of the landscape, with every farm, track, copse and hamlet recorded. Many of these features would have been unchanged for centuries, reminders of ancient patterns of settlement dating back to Saxon times. By the late 1890s, the Ordnance Survey had produced two complete series of maps of England & Wales but the increasingly rapid pace of change and development meant that revising them was now a never-ending task. The main cause of this change was the growth of the railways. From being little more than a good idea in 1830, the network covered over 18,000 miles by the end of the century, enabling the spread of goods, people and ideas and changing the character of every place it touched. The original Ordnance Survey Popular Edition series was conceived before, but published just after, the First World War. This was the first of Ordnance Survey’s series to be conceived from the outset as a mass-market product, and the first to be produced in full colour. The new technology was put to the test in catering for a wholly new market. If the railways were the transport revolution of the 19th century, the motor car was certainly that of the 20th. Some areas have limited stock availability. If the Map of your selected area is not available you will be advised of this on the Website at the time of making your application in which case you may then choose a Map of a different area. The map of your chosen area will be from one of the three available series. Unfortunately it is not possible to choose which series your map is from. The Map is available for delivery in the UK only. £2.99 P&P charges will apply. In February 1804, some ten months before the publication of the first Old Series sheet, the Cornish engineer Richard Trevithick, in order to win a bet, built and successfully operated the first steam locomotive to run on rails. He was unable to capitalise on this achievement and it was left to others, notably George Stephenson, to refine and develop this new technology over the next 20 years. The result was a railway-building boom that was to transform the country. Less than 100 miles of track existed in 1830; this had grown to 1,500 miles by 1840, and to 10,400 miles by 1860. The effect on the areas through which the railways passed was often dramatic, particularly around large junctions and termini: an estimated 4,000 houses, for example, were demolished during the building of St Pancras station in London. This revolution helped drive Britain’s increasing prosperity and industrialisation during the rest of the century, and contributed to numerous social changes including the growth of trade unionism, the advent of tourism and the standardisation of national time. The railways also enabled goods and people to be quickly transported to and from large towns and cities, so hastening the existing trend towards urbanisation. In 1800, around 75% of the population had lived in the countryside and the rest in the towns; by 1880, these proportions had been reversed. As a result, many long-familiar aspects of the landscape were changing for good – and changing far more quickly than they could be mapped. Within a few decades of the first appearance of the one-inch Old Series, it had become clear that the process of surveying, revising and re-publishing maps of Britain was to be a never-ending task, the more so as the maps were increasingly being put to a wide range of civilian, as well as military, uses. The government and the Ordnance Survey took several measures to address this issue. From the 1840s surveys were carried out at increasingly detailed scales and were used for many purposes including railway construction, geological survey and sanitary reform. In order to ensure complete and accurate coverage, the 1841 Survey Act had already given surveyors the right to ‘enter into and upon any land’ in the course of their duties. Having moved into new premises in Southampton after a fire in 1841 had destroyed their overcrowded Tower of London headquarters, the Ordnance Survey, armed with its new powers and instructions, began work on re-surveying the country. The results, published at the one-inch scale between 1876 and 1896, were later to be known as the New Series. These used the same Cassini projection and origin of Delamere as the earlier Old Series maps. Indeed, the first New Series sheets were little more than reprints of the northernmost Old Series sheets but with a new numbering system. In 1893 a more thorough revision was undertaken which resulted in the publication of 346 sheets, between 1895 and 1899, of what became known as the Revised New Series (later sheets were merely the same with hachured hills added). Improvements in reproduction and printing techniques helped these to be even clearer and more accurate than their predecessors. By this time, however, another change was being demanded; for from the early 1890s, the military was pressing for a one-inch map in colour. Financial, technical, aesthetic and political considerations as to how this could best be accomplished were hotly debated between the numerous interested parties. In late 1896, the Ordnance Survey concluded that sales of the new maps to civilians would help subsidise the costs, a consideration which helped drive forward production of the first colour one-inch map the following year. Even then, the debate continued, and some features, such as the use of green for woodland (which only appeared on sheets 1 to 73, north of the Preston to Hull line), were amended as the series progressed. Although the final results were something of a compromise between the often incompatible aims of the military, the Treasury and the Ordnance Survey, the Revised New Series in colour stands as an elegant portrait of late-Victorian Britain. As the first coloured one-inch map series, it was also the precursor of Ordnance Survey’s 20th-century mapping which, from the Popular Edition onwards, would be increasingly determined by the demands not of the military but rather of the civilian market. The Revised New Series captures Britain at the height of its imperial prosperity. All but the very largest cities still had clearly defined boundaries, but with little of the urban sprawl that has since overtaken so much of the landscape. The construction of over 16,000 miles of railway track (of which about half survives today) had made its mark on the physical landscape, both by its very presence and through the social mobility that it helped encourage. Alongside and, increasingly, beneath these new developments, the maps still clearly show many of Britain’s more ancient features and settlements: but these are now dominated by the new Victorian urban society which in many ways forms the basis of our own.